It is essential within the church as an institution to do all things “decently and in order” (1 Corinthians 14:40). It is also imperative to structure the organization so as to preserve the freedom of the church to respond to the mandate of Jesus Christ and the need and opportunity for ministry without unnecessary hindrance. Therefore, the following organizational structure is established on the basic premise of assigning appropriate responsibility for policy and decision making, for review, and control. Further, the structure assumes that appropriate and responsible boards will establish the procedure for analysis, planning, determining ministries, and writing personnel policies pertaining to persons under their appointment. A preaching point is a group of people holding services in a place outside the bounds of an existing United Brethren church, with the goal of eventually becoming a full-member congregation. A preaching point organized or not organized into a local church. One or more appointments or local churches outside of the United States which are administered by the Global Ministries Leadership Team. a. West Region. All churches in Indiana and in all states west of Indiana, except for any states specified as part of a different region. b. Central Region. All churches in Ohio, Kentucky, Tennessee, and the part of Pennsylvania north of Pittsburgh and west of Oil City. c. North Region. All churches in Michigan. d. East Region. All churches in Pennsylvania not part of the Central region, and in these states: Alabama, Florida, Georgia, South Carolina, North Carolina, Virginia, West Virginia, Maryland, Delaware, New Jersey, and the northeastern United States. 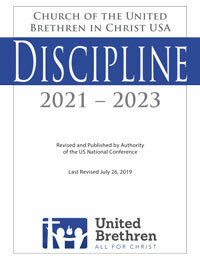 All United Brethren churches in the United States comprise the national conference known as the Church of the United Brethren in Christ, USA. All United Brethren national conferences are part of the Church of the United Brethren in Christ International. Any person who has been elected to an office is entitled to immediate possession of all papers, documents, books, records, and minutes pertaining to the past acts and proceedings of said office; and the predecessor shall turn over all such documents and records in his/her possession.